Are you an affiliate marketer looking for ways to increase clicks on your affiliate links? In this case study, we’ll discover how Top 6 Digital used exit-intent optins to increase revenue produced from affiliate links 30%. Top 6 Digital focuses on generating high-quality converting leads for leading online advertisers. The Top 6 Digital strategy is based on a proven track record of combining market insight, disciplined risk management and strong advertiser relationships to exploit attractive relative-value opportunities. Nadi Lopez, Marketing Specialist at Top 6 Digital, talked with us about how they’ve used OptinMonster to explode their revenue. In fact, at one point, Nadi even demoed a competitor’s software that cost six times monthly the cost of OptinMonster, expecting to find new features and benefits that would convince him to move to that product. Let’s take a look at how Nadi uses OptinMonster to increase revenue 30% at Top 6 Digital. Did you know that nearly 70% of visitors to a website leave without taking any action? Our Exit-Intent Technology allows you to show an offer to the visitor just as their mouse motions towards the browser (an indication they’re about to leave). That is your last opportunity to convert that visitor with your best offer. Top 6 Digital displays exit-intent lightboxes customized to the content the reader is viewing at the time. 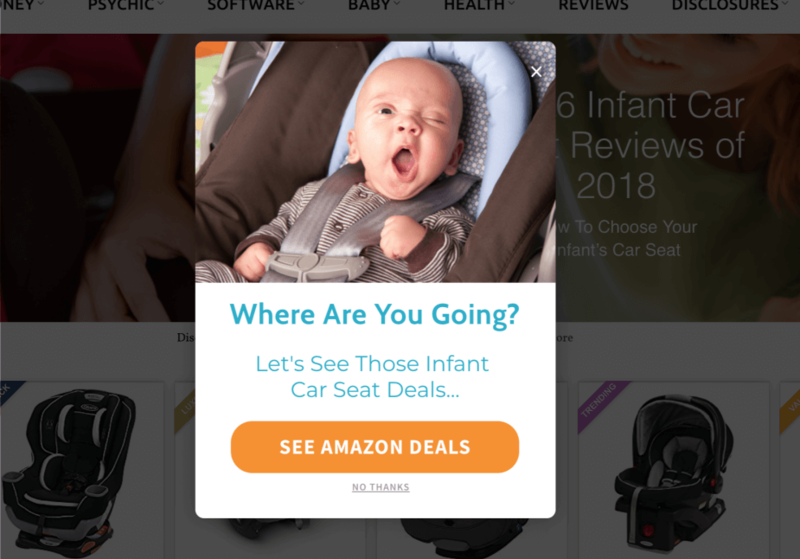 For anyone viewing an article or review about car-seats, who then attempts to leave the site, the optin below offers to redirect the visitor to deals on car seats. The button leads to an Amazon affiliate link for the car seat product category. 17.31% of visitors who see this optin click the affiliate link. 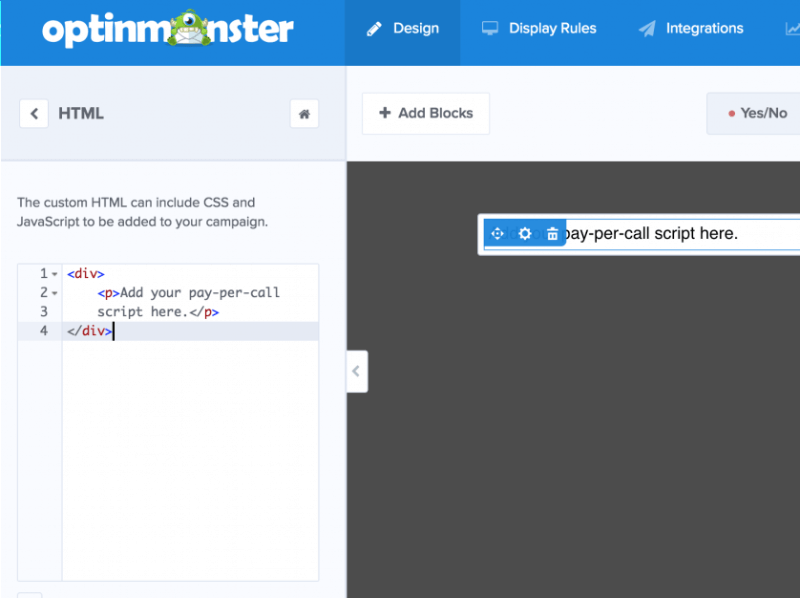 Using OptinMonster’s new drag and drop builder, Top 6 Digital can also create customized optins with multiple, complex calls-to-action (CTA). In the optin below, Nadi display two different CTAs. The first is a dynamically generated phone number for a pay-per-call affiliate program. The program provides a script which randomly generates a phone number for each affiliate account. Anytime a lead is generated from that phone number, the affiliate is awarded a commission. Nadi is able to add this custom script to any optin using our Custom HTML element. The Custom HTML element allows you to add your own HTML, scripts and CSS to any optin. He also displays a call-to-action using a button that redirects to that same affiliate program’s landing page. 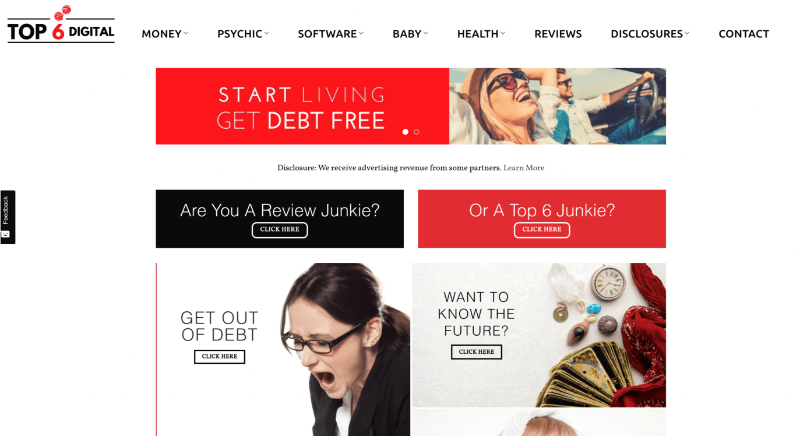 This optin only appears on debt consolidation reviews, and converts 5.45% of visitors who see it. 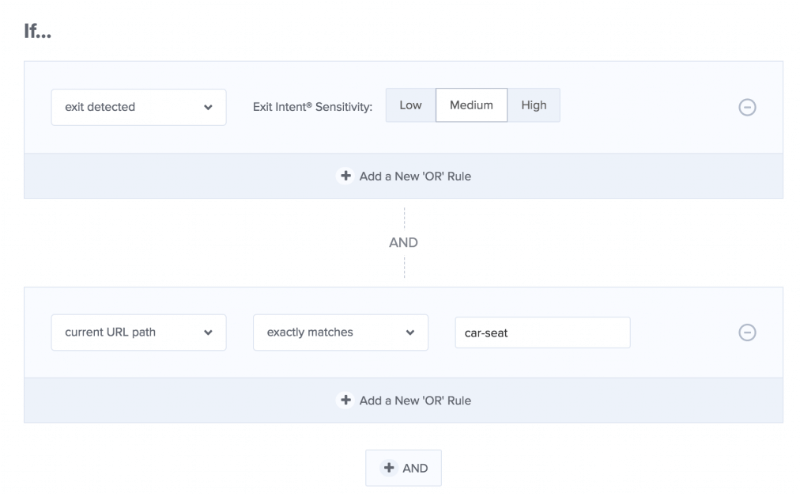 OptinMonster’s powerful display rules let you target when, where and for whom optins can display. 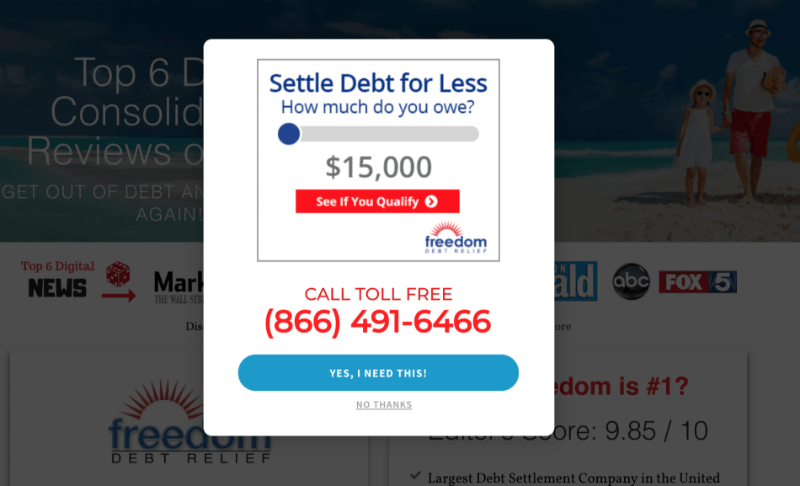 Each of these optins are targeted to appear only on pages related to the offer, so that a visitor reading about debt consolidation isn’t shown an offer for car seats. Here’s another example of how Top 6 Digital uses those display rules to target the interests of their reader. This optin only appears on pages related to tarot cards or psychic readings. 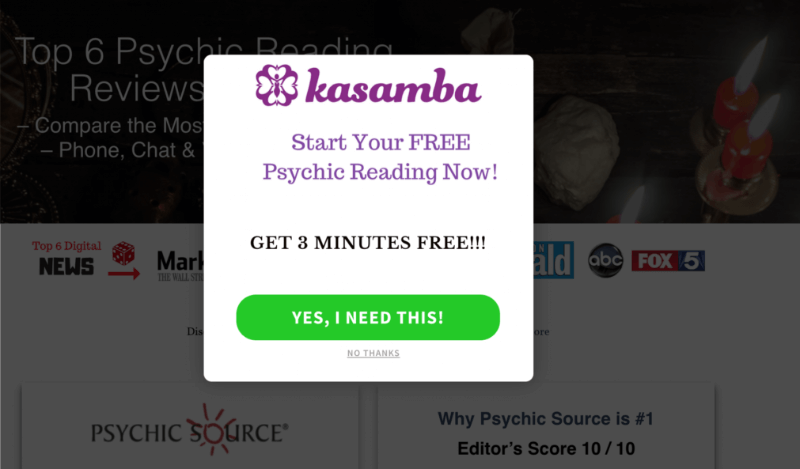 The button links to an affiliate offer for a free psychic reading. This optin converts 32.27% on average, but on specific pages, as high as 62% of visitors. Other affiliate marketers have seen similar success using exit-intent optins. Discover how IMSource exploded conversions 6,500%! Once Top 6 Digital found that exit-intent optins worked well for them, they repeated that strategy on several categories of their site with continued success. Top 6 Digital increased revenue 30%. Top 6 Digital converted 62% of abandoning visitors. Top 6 Digital converted 17.31% of targeted subscribers. Top 6 Digital discovered that redirecting visitors to an affiliate offer with a strong call-to-action using an exit-intent optin led to increased clicks on affiliate links. For some people, I’m sure OptinMonster is just a side show in their business, but for us, it’s a critical part of our success. We have increased revenue 30% since using OptinMonster.